Great picks - fantastic colors! I especially love the solids you chose! BRILLIANT choice of fabrics, John! My hubby tends to think that my choices are too sweet-ishfor out little son (almost 2 years now), and I really feel it is time for him to have a handsome 'little boy' quilt. 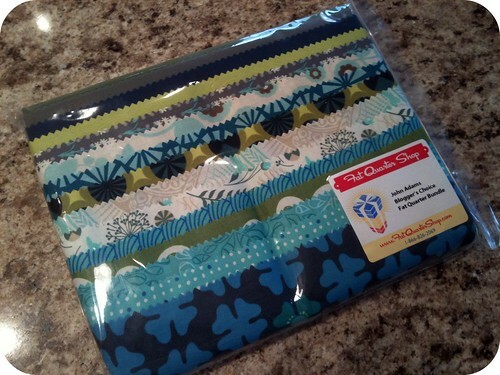 I do believe this bundle would stand the test, and I am already on my way to FQS to grab a pack! I love your selections, John!!! Fantastic bundle! I've had it in my cart over at the FQS a couple of times - haha! I'm going to see if I'm the lucky winner over at the Jolly Jabber blog first, though :) I think "Swoon" would look amazing in this fabric bundle. 'Can't wait to see what you make with it! Nice, nice. I have never shopped at the Fat quarter Shop ... guess it might be time! Just catching up as I haven't visited you for a while and have been a little slack on the comments. I love your half square triangle pillow and the points are sooo perfect. Your blogger's choice bundle is great for males. I particularly like the rich blue on the bottom with 4 leaf clovers and seahorses (or chess knights - depends how you view it!). It's sort of a 'beach and bush' or 'rest and relaxation' pack of fabrics :D.
Yo John....Love what you picked....especially the solids as such I think your quilt needs to be something simple but fun. I vote for a Zig Zag alternating those solids with the the prints. Green,print, grey, print, navy, print, green, print, etc...in the exact order that they are in the top photo. Bow Ties! 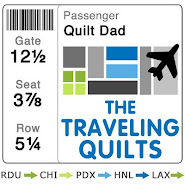 That's what my next quilt is going to be. Great colors. I'd go for a modern log cabin quilt. Your choice of fabrics is my choice. I love it! I tend to gravitate towards blues and greens so you know I will be picking up this bundle asap! I have an idea/inspiration for what you could do with your bundle. I had fabric that I really wanted the fabric to be the main attraction on the quilt so I did this: http://www.flickr.com/photos/81899061@N00/5637713661/in/photostream -- This is on my photostream, but I am really not trying to toot my own horn, I just really love the offset squares, the uneven frames... basically I just LOVE this quilt. You could try something like that. ?? Good luck! Pretty, pretty fabrics! I like the garden arbor pattern you mentioned in your Jolly Jabber post. I think it would do a great job of showcasing the fabrics! I love your fabric bundle. The hardest part of the quilting project for me is selecting the fabrics. You have a gift! Ooh great choices. Love the japanese-ish wave pattern near the top of the stack. 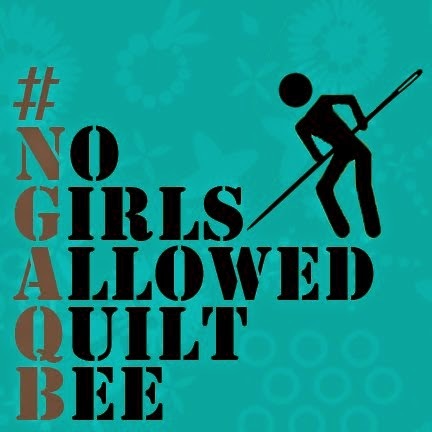 I used a similar print in the first quilt I mad for my mom - a somewhat fussy log cabin. And I just cut up a bunch of those Tula Pink circles last night. Well done! How about a tumbler quilt? I just love them! It would look great with the pops of solids! Maybe my idea wasn't a great one, my word verification is 'cringe'. I really adore these colours! I look forward to seeing what you come up with. I'd do some sort of chain with pinwheels in the alternate blocks, because I am leaning toward traditional blocks lately. I'm sure you'll come up with something infinitely more interesting and I can't wait to see! Nice choice of fabrics and congratulations for being chosen for this project! I'm sure you're going to make up a new pattern for this colour-combo ;o) Something very John-ish. LOL. Good job!